Sintra is a perfect destination for a trip from Lisbon! It is a great place to visit for independent travellers, backpackers, families or people travelling by campervan. Sintra is located fairly close to Lisbon and well connected! On top of that, it’s quite difficult to drive to Sintra by car. As you approach the town, the roads get very narrow and there’s not very much parking. The historic centre also often gets jammed with traffic as tourists all try to park in the very few spots! So, it’s much easier to see the sights in Sintra using trains and buses, or other modes of public transportation. Travelling from Lisbon to Sintra is easy and even in towns like Cascais and Estoril, there are regular bus lines running. 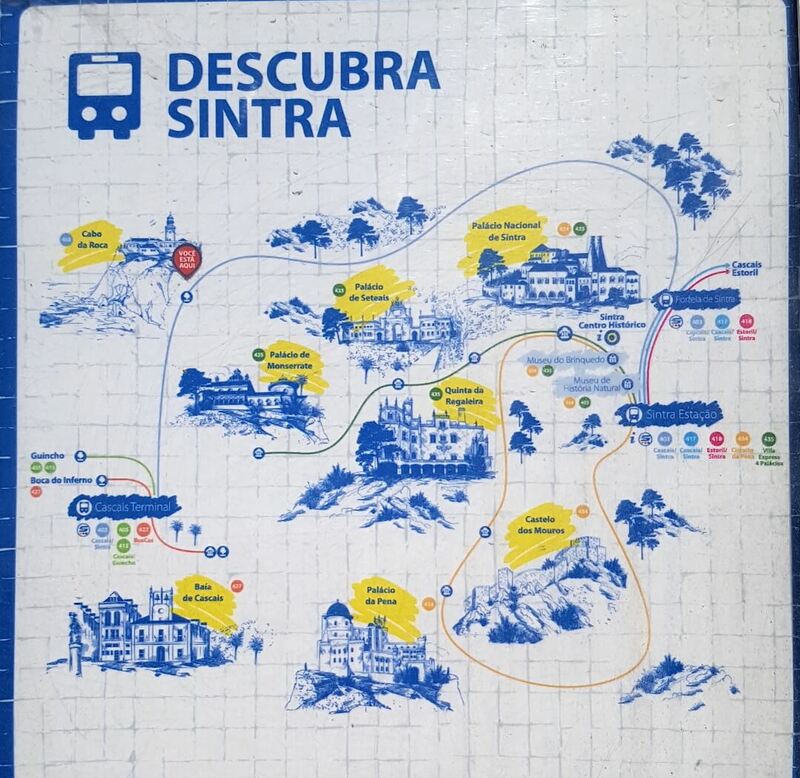 The Sintra bus system is well designed and it’s easy to get around. Getting around in the town itself is not hard – as long as you are prepared! Even though I would argue Sintra deserves more than one day if you are short on time a one day visit will give you a flavour of this magical town. The best tip I can give you to make your day in Sintra a successful one is to have a look at the different transport options in Sintra and plan your day to make the most out of it! 11 Have fun in Sintra! Sintra is connected to Lisbon by public transport which is reliable and fairly inexpensive. There are two stations in Lisbon where you can catch the train to Sintra. One is the Rossio station and the other is the Gare de Oriente station. The Rossio station is located in the historic centre of Lisbon. So this one is the easiest to depart from if you are staying in Lisbon. The Oriente station is the closest to the airport and is a main transport hub northeast of Lisbon. There are also bus stations here and a big shopping mall opposite. Gare de Oriente is easiest to depart from if you are arriving in Lisbon and planning to go to Sintra right away! 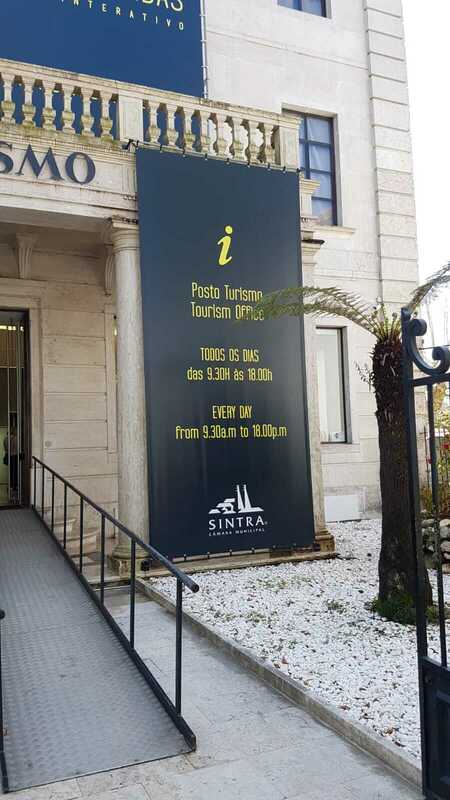 It takes 47 minutes to get to Sintra from Oriente station and 40 minutes from Rossio. There are also two train stations in Sintra. The first station, Portela de Sintra, you will probably just pass by on the line from Lisbon. It is located a fair bit outside of the historic centre. It only makes sense to go there if you want to get a feel for the city of Sintra outside of the historic centre and the palaces. Both the Rossio and Oriente train routes have many departure times as they are urban routes. Trains go every 20 minutes and during rush hour sometimes even every 10 minutes! You can’t pre-book tickets for them either, but you won’t need to anyway! There can be long queues for tickets at the Rossio station, but there are usually enough seats on the train. For the train timetables go to this website, scroll down a little and press the drop-down button for Lisbon Urban Services. The “Lisbon <> Azambuja/Sintra” timetables are the ones that show times to and from Rossio/Oriente to Sintra. They also display the English translations for the Portuguese so you can download the timetable and not get lost! Or just use the simple wizard on the website mentioned above, fill in the details and find the timetable. Once you’ve reached Sintra from Lisbon, it’s quite easy to get around. Based on what you want to see and how much time you have, there are local buses passing by all the sights, or buses reaching as far as Cabo de Roca and Cascais. Buses in Sintra all start and terminate at the train station. The station is about 1.5km from the historic centre of the town. For a full list of all the Sintra buslines and bus timetables (including the ones I am about to tell you about) you can have a look at the official website timetable here or plan your trip here. The 434 Sintra bus route has been specifically designed for tourists visiting Sintra as a day-trip. 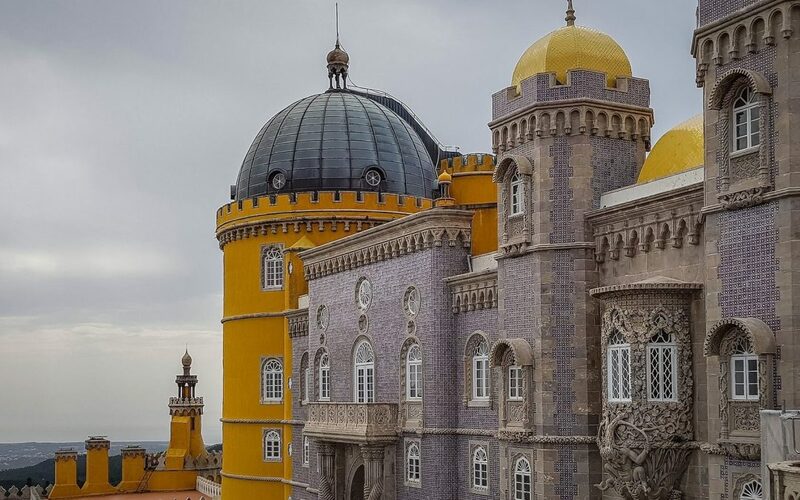 The bus leaves from the Sintra train station climbs the hills to the National Palace, the Moors castle and the Pena Palace then returns to the train station. Since it can get very hot in the hills of Sintra, and the main sites require walking steep hills, it is much easier and more enjoyable to catch this Sintra bus to see all the sights! The roads are very narrow and there is hardly any car-parking after 9am so it’s also better to take the bus than drive yourself. The first bus departs at 9.30 am and the last loop of the day departs at 6.20 pm. Between those hours the bus departs the train station every 15 minutes. The 435 bus is similar to the 434 but it stops at different places. 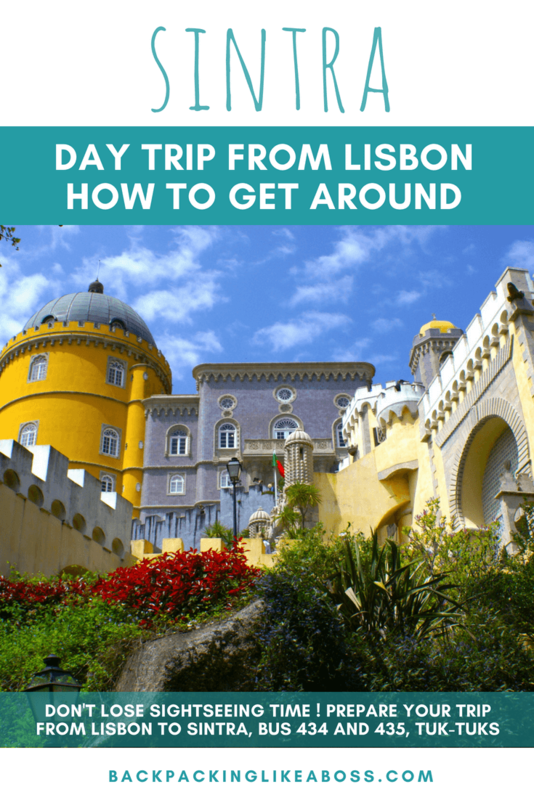 So if you want to visit sights like Quinta da Regaleira, the Seteais Palace and the Monserrate Palace then this is the one for you! Of course, this will also take more time so you probably will need to be staying in Sintra to be able to see all the sites. The 435 also departs from and returns to the train station and runs every 25 minutes from 9.40 am until 6.15 pm. If you are visiting the beach-side town of Cascais and want to visit Sintra then that is easy too! There are two different bus services if you want to travel to Sintra from the town of Cascais. The 417 bus is slightly faster (30 minutes) but the 403 goes via a more pretty route along the coast and past the Cabo de Roca cliffs. The 403 takes an hour but for the same price, you get to see some extra beautiful scenery! They both start at the Cascais bus station and terminate at Sintra train station. Then you would need to get the 434 bus to go up and discover the sights of Sintra. There are a number of different options for buying tickets to explore Sintra by bus. You can find all the different price options for touristic / combo tickets by Scottbus here. The 434 Sintra Bus costs 6,90 for a hop-on hop-off line. If you catch the 435 loop-bus it will cost you €5 but you can use this ticket to hop-on and off at each site (but only in one direction). You can buy combined tickets for travelling to and within Sintra if you are coming from Estoril or Cascais. This one-day bus pass includes the 434 line and costs €15 at the time of writing and is valid for 24hrs. There is another way of a sightseeing bus in Sintra: the hop-on, hop-off sightseeing bus! Run by the worldwide company that offers comfortable sightseeing bus tours this is also a very easy way to see all the main sights in Sintra in one day. These tours come with pre-recorded commentary in 12 different languages, so you can learn about what you are seeing in comfort. The buses also have Wi-Fi and the tickets are flexible and valid for three months. Tickets start at €18 – have a look at the website for more information. They even stop at Praia Grande if you want to squeeze in a short beach visit! If you don’t want to wait in line and then ride a bus crowded with other tourists there are some other options. You might like to have exclusive transport within Sintra using a taxi! Taxis are usually available outside the main train station in Sintra or opposite the post office. They are metered taxis so to go one-way up to the National Palace will cost at least €10 and probably more if there is lots of traffic. Then if you want the taxi to wait for you the meter runs for about €15 an hour. But hey, if you have the money this could be a nice way to see the sights of Sintra! 😉 It might also be more affordable if you are travelling with a few people to share the costs. If you prefer to travel using Uber instead of taxis then you could do this in Sintra too. There are not too many Uber drivers, but I used an Uber cab to get back to Praia Grande where my campervan was parked. To get an idea of the price, this useful website can even estimate how much an uber fare will cost according to where you want to travel to and from! Similarly to the taxis, if you are travelling with three or four people together this could turn out to be cheaper than using the trains and/or buses. Maybe the buses are too crowded (or the lines are too long) and you don’t want to use a taxi. Then you could also try a tuk-tuk to get around in Sintra! In the busy historic centre, you can easily find tuk-tuk operators to take you where you want to go or you could book an eco-tuk-tuk-tour through Tuk on Me! It will cost about €5 for a tuk-tuk ride from a driver off the street, and the eco-tour needs to be booked ahead and is probably more expensive. But it is also a full-day tour which will take you to all the main sites. The tuk-tuks can be very noisy and in my opinion, do not benefit the charm of Sintra. LAS Tours gets raving reviews on Tripadvisor. They provide you with a small yellow car with a GPS guided tour. A 1,5 hour trip costs 35 euro for two people and it looks like great fun! There are several places in Sintra where you can rent (electrical) scooters. Another fun way to discover Sintra by yourself. Check out Sintra Magic Scooter or Park E-Bike. As I was staying with my campervan on the parking lot of Praia Grande, I tried to catch the tram on my way back there but I was too late! Seems that in off-season the tram does not run very often, nor very regularly. In the off-season (click for timetable) the tram usually runs on Saturday and Sunday and has some departures during the week, but in summer it is in full-swing and costs €3 each way. Reportedly, you can buy tickets at Vila Alda from the driver and enjoy a 40-minute ride, although it is very popular! The tram departs from outside the Museum of Modern Art. For more information and a timetable you can have a look at the municipal website here. Out of all the transport options in Sintra, this one is the hardest 🙂 All the castles, villas and gardens are tucked away in this hilly area. Although beautiful, it’s definitely not the most efficient way to get around. Especially if you are trying to cramp multiple attractions in one day! It takes at least one hour uphill to reach the first castle. 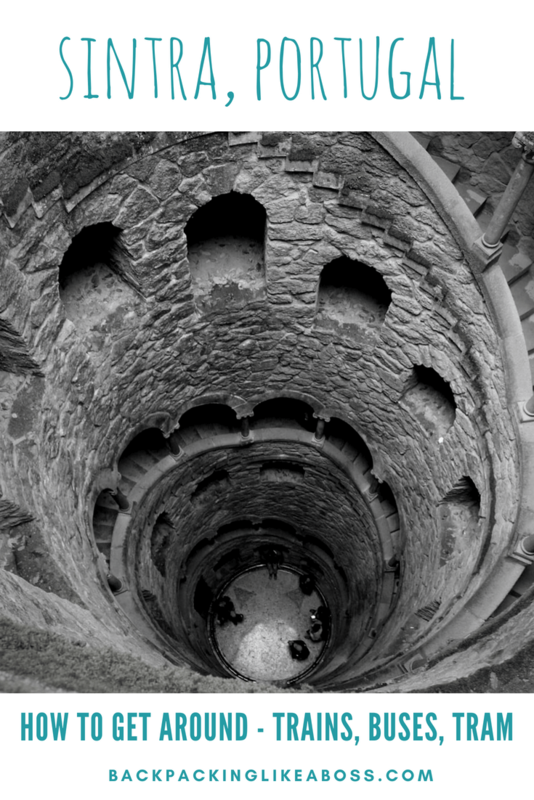 Walking to Quinta da Regaleira is a fine 20-minute walk from the town. Walking between the Pena Palaca and Gardens and the Moorish castle is also possible. You can get a map with all the pedestrian routes from the Tourist Office in town. If you really want to go to Sintra by car, there are several options for parking. You can park outside the centre – there are plenty of parking spaces there. Then you walk into the old centre in about 20-30 minutes. There is also a parking lot right underneath the hill on which the old town is built. You get here by driving into the old town, past the station, and go right at the roundabout. If you want to visit the attractions by car, be early! There are multiple parking spaces on the hills but they fill up very quickly. I would not recommend doing this with your camping car / RV. Small vans can do this. 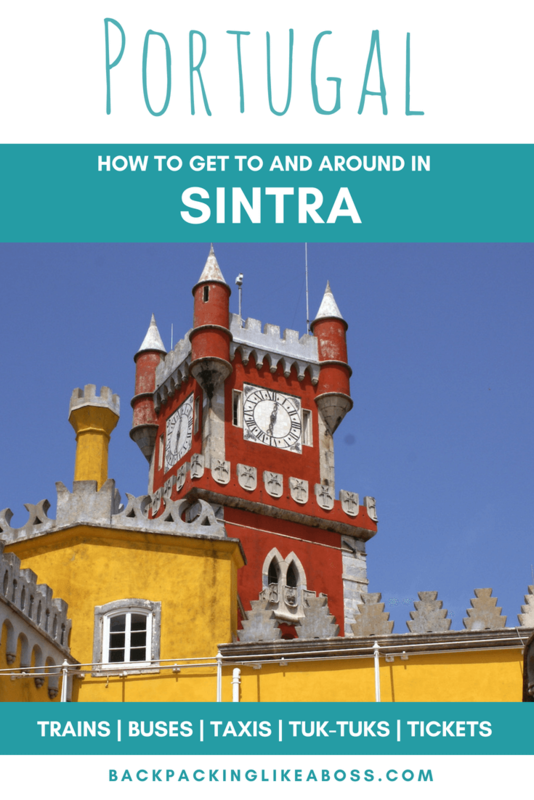 I hope this guide will help you find your way in Sintra. It’s an amazing place with lots of fun to be had! The tourist office is also very good and open every day, if you may need it. Cover picture by Walkers on the Way, Pixabay.